Polarium® is a revolutionary, permanently magnetized platinum alloy developed by Steven Kretchmer for a line of jewelry that exhibits amazing behaviors, including levitation! It is 77.7% pure platinum, extremely hard, and resists scratching far better than any other precious metal jewelry alloy available anywhere - exclusively at TQ Diamonds! Inner Secrets Halo Band insert, which can feature flush-set diamonds, rubies, or sapphires inside the ring. 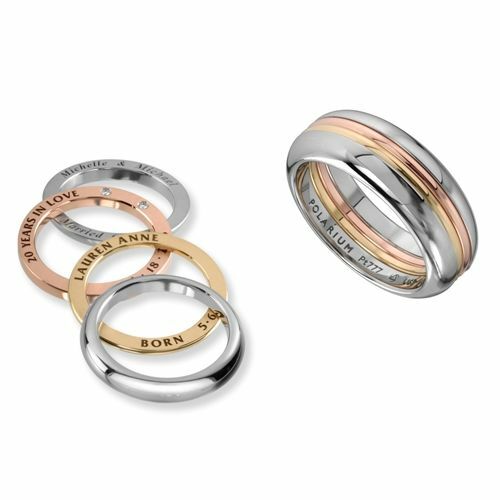 Shown with Inner Secrets Half Round band (not included in pricing) A personal engraving can be hidden inside this ring. Metal finish choice, engraving options, ring size, band shape, font for engraving, and engraving instructions may be selected in "drop down" box at "Add to Cart" area. The bands may be customized with flush set 0.01mm diamonds on the inside. The diamonds are $80/each.